There were a few awesome new releases over the weekend but the one that really stands out and satisfies my braindance bug is Volitune's "C" EP. Along with his 5 new tracks come 3 excellent remixes by fellow electronic artists that are so varied, the whole collection feels like 8 unique tunes. 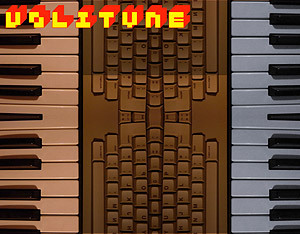 Volitune's sound is reminiscent of early IDM and oldskool-ish Detroit house but he waves his magic acid wand and whips up a new blend of sonically pleasing braindance laced with live bass guitar, creative riffs, and vintage gear. Opening track "Exotica" is a fast-paced, jazzy, drill 'n bassy number that makes me wonder if Volitune's last name is secretly Jenkinson. The 3 remixes of this track by Oxynucid, Mrs Jynx, and Scrubber Fox respectively take it into 3 entirely different directions, all of them good. As the album moves on, the mood shifts to a bit of a funkier, head-nodding, foot stomping, acid house frame of mind with some tricky beat programming and a dash of sinister downtempo mixed in for good measure. I have absolutely nothing bad to say about this release other than it's over too soon.